Date: Friday evening 26th May, with briefing @ 1700 sharp outside club dinghy centre. 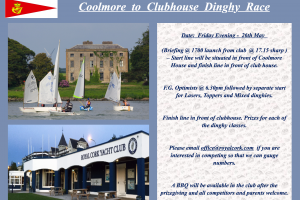 Open to all club junior dinghy sailors.Launch @ 17.15 .The start line will be situated in front of Coolmore House and finish line in front of the club house. F.G. 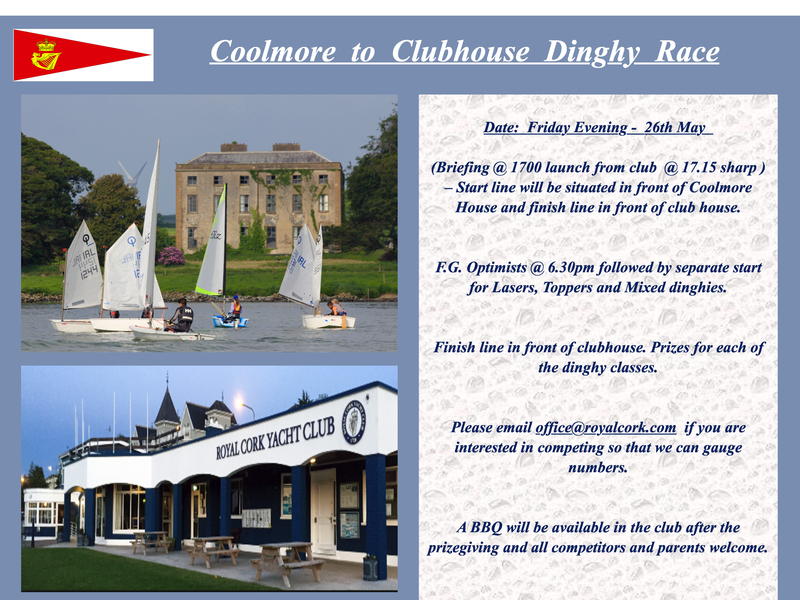 Optimists @ 6.30pm followed by separate start for Lasers, Toppers and Mixed dinghies. Prizes for each of the dinghy classes. Club boat Adriele will be on hand to take any junior members who are not sailing on the water to watch the race. A BBQ will be available in the club after the prizegiving and all competitors and parents welcome. We look forward to seeing you all on the evening.